Recently I got a comment which basically says that he wants to know a particular brand’s sizing chart. Actually, I got similar comments before so I decided to have a web page, which is dedicated to the sizing (MMA gloves and shin guards), on my site. There are many brands and some have different sizing charts than the others. So I gathered sizing information of MMA gloves and shin guards for you to see them in one place. In this article, you can also find how you should measure your hands for MMA gloves and shins, calves for shin guards. I also tried including some of my reader’s questions about sizing. 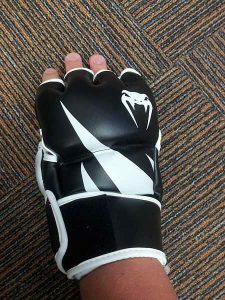 Let’s start with sizing information of MMA gloves and after that, you can find sizing information about MMA shin guards. Note: Many people are asking me questions about sizing information of various brands so time to time I will update this page with different brands (both MMA gloves and shin guards). Everlast uses the classic method for determining glove size. You should measure the circumference around your palm across your knuckle which is actually commonly used by many companies. However, there are a couple of different MMA glove types. The following information is for Venum MMA training type gloves including Venum Attack and Challenger. This sizing guide for above is for all Venum MMA gloves including sparring Gloves (Venum Elite). You can choose your Hayabusa MMA Gloves or Hybrid Gloves according to this sizing information. Even though I have not used ATF Sports MMA Gloves before and it is really not popular, a couple of people asked for ATF Sports sizing information. As you can see the sizing changes from company to company. This depends on padding quantity, density, design, and type. If you have MMA gloves sizing information which you need, definitely check out these best MMA gloves and choose your pair accordingly. Shin length: Start measuring below the kneecap and end it at the top of your foot (this includes instep models). Circumference: Measure around the widest part of your calf. Let’s start with Hayabusa Shin Guards since these are fairly popular, have really good quality and I also have awesome experiences with two models. This is another popular brand and Venum Shin Guards can be used for Muay Thai and MMA. I also need to tell you this. In Thailand, there are a lot of people who are really satisfied with the fitting of Venum Shin Guards and as you can see Venum does not need your calf circumference. Just measure your foot length and measure the height according to the explanation above. If Combat Sports shin guards have hook and loop straps, consider the sizing information below. If you are between 5’6″ and 6’2″, get regular. If you are taller than 6’3″, get large. These are popular brands’ shin guards on the market. I also included some of the requested ones from my readers. With that, if you are interested, you can check out these good-quality MMA shin guards which have great fitting rates and as you may know it is just vital for your kicking and grappling performance. I tried to be thorough as much as possible with the brands and measurements and I actually have alerts so if a brand changes its MMA gloves or shin guard size charts, information etc. I will update this page. Also if you have a look at the shopping sites you will see some of the products which have sizing info so you can just go with it. In the meantime, you will not find some of the brands’ sizing charts however you can find them on here. So I highly suggest you bookmark this page since you can also have a look at the other brand’s sizing guide in the future. After a myriad of requests, I just had to have this page on my website so I hope that it will be useful for you. If you wonder about a certain model’s sizing or fitting rate etc. feel free to comment below and I will get back to you. Previous post: How to Lace Up Boxing Gloves? – Very Easy Methods! Next post: Phantom Training Mask Review – Should you Get It?